The infighting in the Central Bureau of Investigation (CBI) isn't a big secret. The two main characters in the story are CBI Director Alok Verma and his deputy Rakesh Asthana. Both were little known officers up until July 2018. What started as an ego tussle blew out when Verma, a 1979-batch UT cadre officer, told the Central Vigilance Commission (CVC) that special director Asthana, a 1984-batch Gujarat cadre officer, was not authorised to represent him in the search committee meetings. Pretty soon by October, the CBI had registered an FIR against Asthana. The government didn't waste a lot of time and got involved by the night of October 23 and appointed M Nageshwar Rao as Interim Director of the premier investigating agency. Both Alok Verma and Rakesh Asthana were sent on forced leave. Rao did what he was asked to do by the government. He made some strategic transfers, and shuffled officers and assigned them new tasks. Alok Verma's reply to the SC appeared in the media. It was meant to be a secret and the SC had even refused the permission to Asthana's lawyers to access Verma's documents. Today when the Supreme Court began its hearing, Chief Justice of India (CJI) Ranjan Gogoi handed the documents to Verma's counsel Falimani, asking him to go through them. The documents handed over by Gogoi to Falimani included some media reports quoting from the reply submitted by Verma to the SC. Falimani too was surprised and he stated that he had no idea how the documents reached the press. Speaking about the CVC's report on Alok Verma, the SC bench of the CJI suggested that probe might be needed as the CVC in its affidavit had some good and some bad bits about the CBI Director. Earlier, on November 19, CBI Deputy Inspector General Manish Kumar Sinha submitted his petition in the Supreme Court and levelled some grave allegations against a union minister. Manish Kumar Sinha, who has petitioned the top court against his transfer to Nagpur as part of the shake-up in the agency last month, said a union minister of state took "a few crores" as bribe to intervene on behalf of a businessman on the agency's radar. 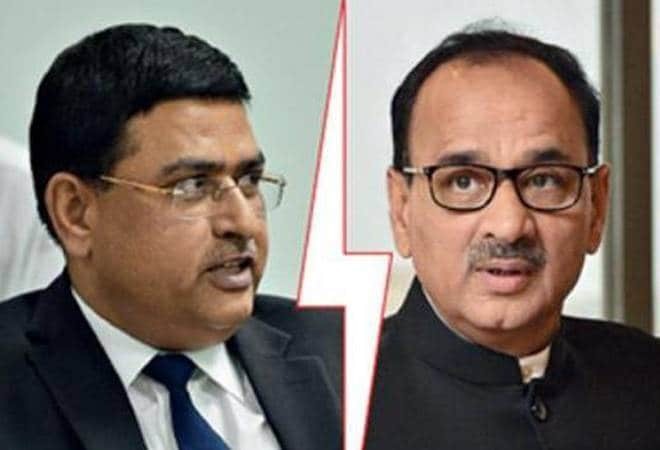 Sinha also questioned National Security Advisor Ajit Doval and alleged that he tried to shield Rakesh Asthana after the CBI registered an FIR against him in a bribery case involving Satish Sana, a businessman, who was suspect in Uttar Pradesh-based meat trader Moin Qureshi case. Satish Sana had alleged that Asthana was paid bribe in the matter of Qureshi, claiming that he had allegedly helped him to get a clean chit from the probe agency. Manish Sinha was looking after the case against Asthana. He was transferred by Interim Director Rao to Nagpur. Sinha had originally approached the court to get his transfer to Nagpur stayed but let the cat out of the bag and spoke about Doval and Asthana's nexus. Ajit Doval was also allegedly instrumental stopping the search against CBI DSP Devender Kumar. The searches were carried out in connection with bribery allegations involving Asthana. Manish Sinha alleged, "While the search was on, a phone call was received from Director CBI instructing to stop the search. At that time, the applicant (Sinha) was sitting in the BSF&C office and asked the Director, to which the Director replied that this instruction has come from NSA Shri Doval."